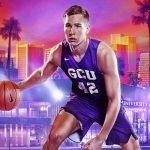 GCU Men’s Basketball takes on Jacksonville University in a home matchup in the GCU Arena Monday, November 12. Tip off for the night starts at 7 pm. Come support your Lopes during their non-conference game!